Wow, this was not at all what I expected! I am not sure why, but I assumed that since Born of Illusion was about mediums that it would be way creepier than it was- man was I wrong and I am so happy that I took the chance to read it. Born of Ilusion follows the story of Anna who may or may not be the illegitimate daughter of Harry Houdini. As you can read in the summary, Anna is surrounded my a very interesting cast of characters who are not exactly the best to her. Anna is a fun character to read about. She makes stupid mistakes but isn't totally dependent on others. Anna has a good head on her shoulders and is a strong heroine who can figure problems out for herself. I found myself really caring about Anna and hoping that things would turn out well for her. Anna's mother... well she is a piece of work. I am sure we will find out in the next book more about the history of how her mother came to be the way she is, but she will never win a "Parent of the Year Award". There are two love interests in Born of Illusion, and I suppose technically it could be a love triangle. It is pretty obvious who Anna really cares about, though, so it doesn't feel like the stereotypical love triangle. Born of Illusion reminds me of some of my favorite magic movies like The Prestige and The Illusionist. It is full of magic, mystery, and is a ton of fun. It is the kind of book that you will read with fervor and won't be able to stop thinking about when you put it down. I highly recommend it! 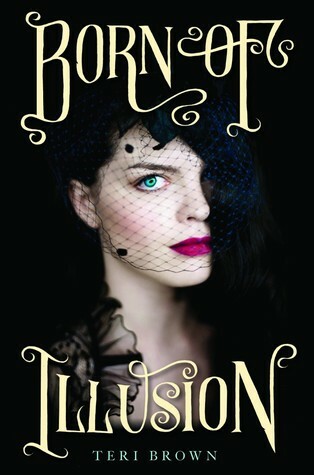 OMG can't WAIT to get my hands on BORN OF ILLUSION! It sounds really good and the cover is awesome too! It's been a few weeks and I am still thinking about this book (partly because I keep seeing reviews of it :) because there were some parts that really lingered with me especially Anna's complicated relationships with her parents.